Image above: Michel Montecrossa live on stage at the Spirit of Woodstock Festival – experience Michel Montecrossa, Mirakali and his band The Chosen Few at this year’s Spirit of Woodstock Festival in Mirapuri, Italy (www.SpiritOfWoodstockFest.com) taking place from 19th to 23rd July 2017 – looking forward to meet you at the Festival! 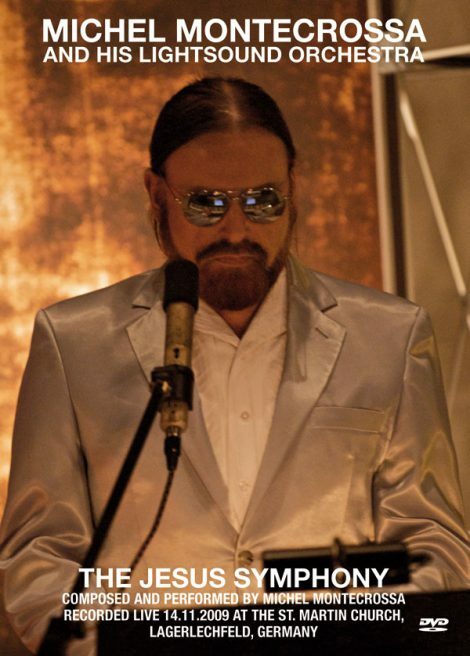 The ‘Saving Message’ Concert has been Michel Montecrossa’s historic opening concert of the Courage & Love Climate Change Concert Tour 2009 presenting 12 songs inspired by Barack Obama’s presidential inauguration on 20/01/2009. Released by Mira Sound Germany as Audio-CD and DVD it includes the songs: ‘Saving Message‘, ‘New President #2‘, ‘True Politics #2‘, ‘Wake Up‘, ‘Another World‘, ‘Climate Generation‘, ‘Changing World‘, ‘Freedomfire Burnin’‘, ‘Good Relations Save The Earth‘, ‘Talkin’ World Unity #2‘, ‘Forgiveness Heals‘, ‘Living On A Planet‘. Michel Montecrossa’s historisches Internet-Konzert für Präsident Obama ist jetzt auch bei Vimeo verfügbar. 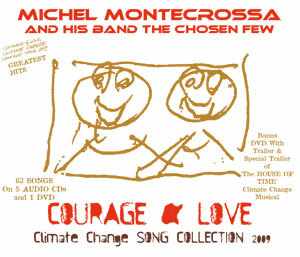 The ‘Courage & Love Climate Change Song Collection 2009’ is the breathtakin’ 6 CD-Box presenting on 5 Audio-CDs and 1 DVD all 63 greatest hits from Michel Montecrossa’s landmark Courage & Love Climate Change Tour 2009, published in the ‘COURAGE & LOVE SONGLYRICS BOOK’. 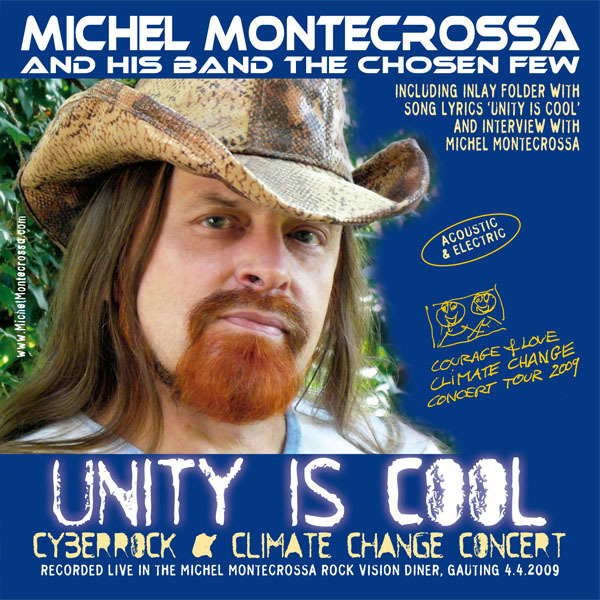 The CD-Box with 5 Audio-CDs and 1 DVD presents 63 Hit-songs from Michel Montecrossa’s landmark Courage & Love Climate Change Tour 2009 and two trailers of his ‘The House Of Time’ Courage & Love Climate Change Musical. The 63 songs include the driving title song ‘Courage & Love’, great message songs like ‘Global Message’, ‘Green Tomorrow’, ‘Earth Story Song’ and ‘Living On A Planet’, ‘Let There Be Peace’ as well as touching love songs like ‘Courage Girl’, ‘Eatin’ And Drinking Together With You’ and ‘All Your Dreams’. 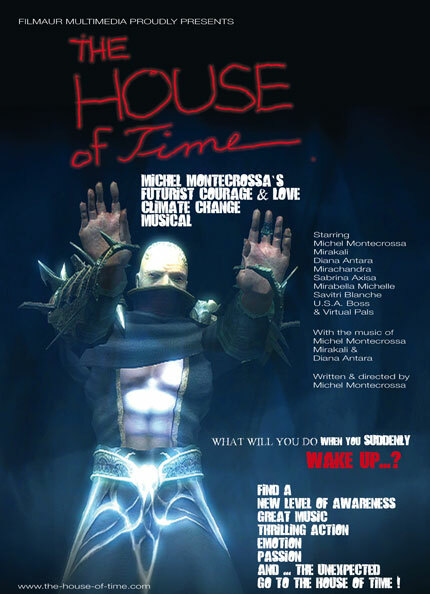 Neuerscheinung: Michel Montecrossa’s 6 CD Box der ‘Courage & Love Climate Change Song Collection 2009’ mit 5 Audio-CDs und 1 DVD mit zwei Trailern zu seinem ‘The House Of Time’ Courage & Love Climate Change Musical. 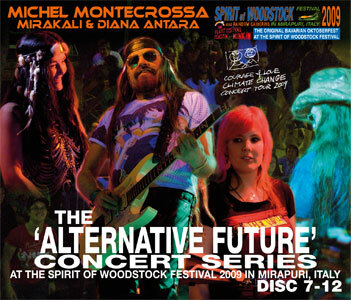 The two six Audio-CD and DVD Boxes featuring all ten days of the ‘Alternative Future’ concerts by Michel Montecrossa and The Chosen Few at the Spirit of Woodstock Festival 2009 in Mirapuri, Italy are released by Mira Sound Germany and present 168 songs by Michel Montecrossa and The Chosen Few. The ‘Alternative Future’ performances are the 14th – 24th concert of the Courage & Love Climate Change Concert Tour 2009 including great songs like ‘Alternative Future‘, ‘Check In – Take Off! 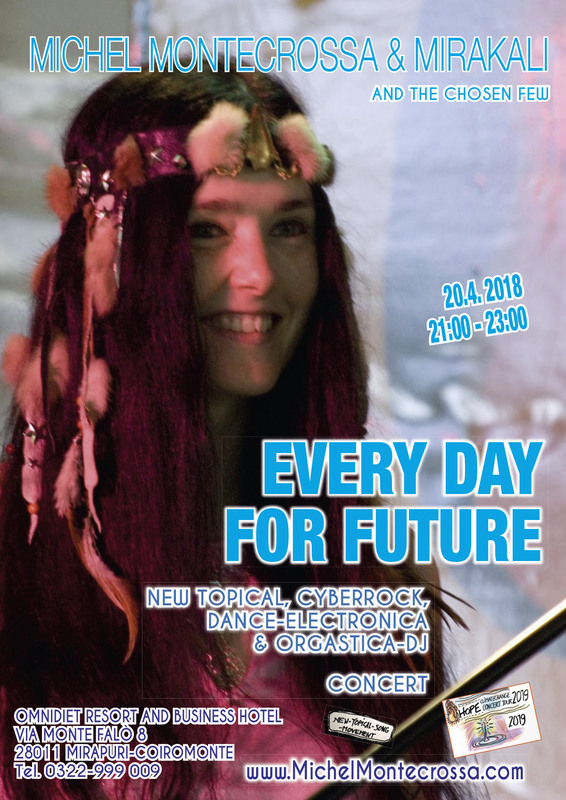 (Be Part Of Your Own True Solution)‘, ‘Eurockess‘, ‘Unity Is Cool‘, ‘Courage & Love‘, ‘Electrifying Climate Girl‘, ‘Space Age Drive Of Tomorrow‘, ‘Solar Evolution & Suntomorrow‘, ‘Sundrive: I Like It‘, ‘Global Message‘, ‘We Are The Others‘, ‘Sunray Revolution‘ and ‘Save The Climate‘. Mirakali and Diana Antara contribute songs like ‘The Heart That Beats Like Yours, ‘Nature Dreams‘ and ‘World Star‘. 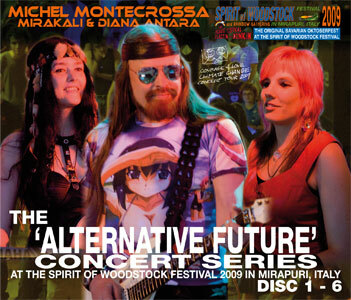 About the ‘Alternative Future’ concert-series Michel Montecrossa says: “At the Spirit of Woodstock Festival 2009 in Mirapuri me and my band perform our 10 days ‘Alternative Future’ concert series. During these concerts we present topical songs dealing with the life on our rapidly changing earth and the impact these changes have on our future.